OK I have been using Twitter for a couple months now. At first I was skeptical, but intrigued - I signed up, formed some opinions and observed. At first impression I thought the micro-blogging service was a bit self-serving. But then I started to get the hang of @Replies and started to build my network. I started following links to cool articles on the Tweeters I am following. I started learning, being inspired, and sharing cool stuff with my followers! 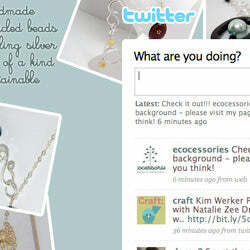 I finally have a new background that shows off ecocessories jewelry and communicates my message. Please come see it and start tweeting with me! Visit my Twitter page here and join the conversation!